Only quantitative 24(S)-hydroxycholesterol ELISA kit available for neurodegenerative research. The 24(S)-Hydroxycholesterol ELISA kit is a complete, colorimetric, competitive immunoassay kit for the quantitative determination of 24(S)-Hydroxycholesterol in tissue culture media (culture supernatant), cerebral spinal fluid and tissue homogenate samples with results in just 2 hours. 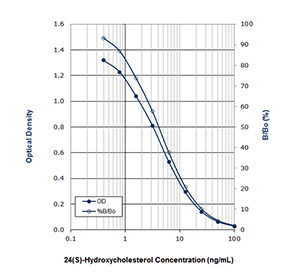 Download our Application Note: A Competitive, Colorimetric ELISA for Quantification of 24(S)-Hydroxycholesterol, a Biomarker for Neurodegeneration"
Application Notes: For the quantitative determination of species independent 24(S)-Hydroxycholesterol in cerebral spinal fluid, culture supernatants and tissue samples. Use/Stability: All kit components should be stored at 4ºC. Scientific Background: The homeostasis and trafficking of cholesterol is an essential component of both the central and peripheral nervous system in the maintenance of neuronal tissues, and disturbances in this homeostasis may be due to the onset of various neurological diseases such as Alzheimer’s Disease, Huntington’s Disease and multiple sclerosis. Apolipoprotein E and Cyp46 (also known as 24S-Cholesterol Hydroxylase) are both important in the homeostasis of cerebral cholesterol and thus are of clinical interest in understanding the relation of these molecules with the pathogenesis of these neurodegenerative diseases. 24-OHC, an enzymatically-generated side chain-hydroxylated derivative of cholesterol, is a pivotal marker in the study of cerebral cholesterol homeostasis. Cholesterol is unable to cross the blood-brain barrier however, Cyp46 enzyme converts cholesterol to the more soluble 24-OHC, and this hydroxylated form of cholesterol is able to cross the blood-brain barrier. This conversion allows for the reduction of cholesterol in the brain and the efflux of 24-OHC from the brain into cerebral spinal fluid and blood. The flux of 24-OHC has been seen in patients with a variety of neurodegenerative diseases. In the instance of Alzheimer’s disease, the change in 24S-hydroxycholesterol concentrations may be indicative of different pathogenetic mechanisms and/or the progression of the disease. As in the case of multiple sclerosis, concentrations of 24-OHC have been shown to decrease, likely due to the loss of neuronal cells responsible for the synthesis.